Drought workshop participants evaluate a pasture in Yuma County, Colorado. Looming drought in 2017 is a concern in eastern Colorado. About 500,000 acres (0.7 percent of Colorado) in central Lincoln County is already in severe drought. A much larger swath across the Eastern Plains counties, covering 23,560,000 acres (35.3 percent of Colorado), is in moderate drought. This region has not received any meaningful precipitation since late summer. When combined with the 2017 weather outlook, ranchers and land managers have reason for unease. 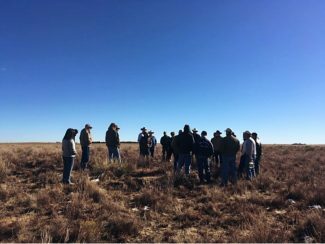 To address this issue, the U.S. Department of Agriculture's Natural Resources Conservation Service, Colorado State University-Extension, and the Yuma County Conservation District partnered to put on a drought workshop at Kirk, Colo., on Jan. 23, 2017. The workshop was well attended, with 25 participants from nine counties across eastern Colorado. The participants were also a diverse group, representing ranchers, government land managers and CSU Extension agents. In the morning, a series of talks discussed range management under drought conditions. Don Schoderbek, CSU Extension specialist, discussed the mechanics of range plants, how plants change during a drought, and what this all means to livestock producers. Did you know that a grass plant sets its growing points (buds) for new growth the previous summer? This means that late summer moisture is crucial for new plant growth the following year. New growth, in turn, is critical to root survival. This is where grazing comes in. Grazing mediates the amount of green leaf material, which supply roots with energy. The roots, despite being located below ground, are the 'body' of the plant year-to-year. Having healthy roots leads to more vigorous plants, which translates into tougher plants during drought. Drought is more than what happens in the rain gauge, it is a dynamic process that affects each ranch differently. It is the link between precipitation and management, according to Roy Roath, retired CSU Professor and Extension specialist. Your management actions in the good years will determine how intense the drought is. Improving plant cover is a place to start. Having higher cover allows you to 'catch' additional precipitation. Roath discussed his work on the Meadow Springs Ranch near Carr, Colo. After 10 years of managing with cover as an objective, the ranch withstood the drought of 2002 without major stocking rate or surface water impacts. Ask yourself, how nice would it be to have healthy, running springs during a drought?